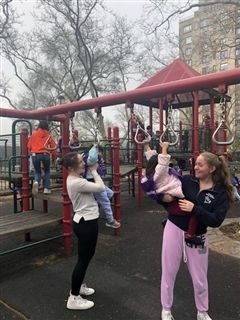 Brearley's Upper School Service club takes some time to run and play with our neighbors at the Clarke School for Hearing and Speech across the street on East End Avenue and 83rd Street. 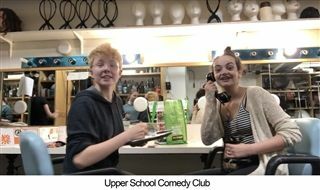 In an effort to build community and educational programming that serves the growth and well-being of both Clarke and Brearley students, the Service Club launched this partnership last school year ,and it has grown to be a cherished communal time that both the Clarke and Brearley students look forward to each month. eNews was fortunate to be able to sit down recently for a chat with Science Department Head, Jim Karb, to learn more about how science is taught at Brearley. Mr. Karb described how the department’s K-XII program fosters the students’ innate scientific curiosity. Teachers and students explore the biological, physical and earth sciences with an eye to medical, ethical and environmental applications. A question is posed, and students are challenged to solve it. 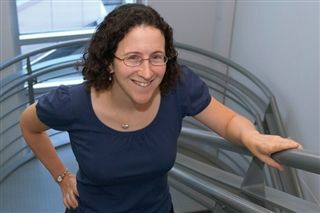 After running an experiment, they collect and interpret data to arrive at a conclusion backed by evidence and analysis. The goal? Brearley alumnae who are scientifically literate and are able to apply their scientific knowledge and reasoning to any field or endeavor. As Mr. Karb notes, “With many lingering messages still out in the world that girls are not good at or don’t like math or science, we continue to show that through good teaching and a focus on students working together to solve scientific questions in the lab, they can lead the way--as they succeed in science at Brearley and are well prepared to use their scientific skills in college and beyond." Brearley students move systematically through layers of age appropriate experiential learning and content. From K to IV they study full general science: biology, chemistry, physical and earth sciences as well as astronomy. Their first experiments start in Kindergarten. Animals such as gerbils, snakes and crayfish are studied. In Class V, robots and electricity are introduced, in the context of physics and chemistry. In Class VI, students study themselves, the human body, in great depth. Earth and physical sciences are further pursued in Classes VII and VIII, with Class VII studying density, heat and energy and applying them to weather systems, and Class VIII studying more in-depth chemistry, water, geology and plate tectonics. Scientific knowledge is applied to environmental issues. Class IX gets an introductory survey course in biology, and Class X the same in chemistry. In addition to physics, students in Class XI may choose to study advanced biology or advanced chemistry. Students can take a combination of any two of these three lab courses, and an elective non-lab course in Environmental Sustainability is also available. Class XII students have the same choice of courses, but can also take advanced physics, which is grounded in calculus. Please click on READ MORE for full article. Dance is a lively and joyful endeavor at Brearley. Under the direction of Marisa Ballaro (left) and Whitney Jacobs of the PE and Athletics Departments, what began as a modern dance program now stretches way beyond to include overarching themes, creative explorations, compositions, dance techniques and styles. The program gives the girls more than just great dance moves. They learn the skills they need to compose their own dances and perform them. Here is a quick “behind-the-steps” peek into our beloved Dance Program. Brearley girls begin their dance careers early, in the well-lit fourth floor dance studio. Accompanied by a live musician, Kindergarteners learn to move to the rhythm of sounds, shapes and pathways while expanding their dance terminologies. The study of creative movement is continued in Class I with a focus on connecting dance to what the students are learning in other courses, Ms. Jacobs explains, “We ask the girls to move in ways that feel good to them, in ways that are unique to them.” Each year, the girls add to their repertoire of dance styles: ballet, jazz and modern dance in Class II, choreography and learning to become “Dance Makers” in Class III, and collaboration, self-choreography and performance in Class IV. What do Robotics competitions, Latin “Jeopardy ”games, stand-up comedy and Model UN debates have in common? They are but a small sampling of the wide-ranging and exciting co-curricular activities being pursued by Brearley students. On any given day at 610, girls may be found planning community service events, rehearsing with choruses and orchestras, writing for student publications, working with 3D printers, learning sign language and debating student-self government. As noted by Upper School Head Evelyn Segal: “The broad range of our students’ interests and the depth of their commitments to their co-curricular activities is extraordinary.” Whether a student’s interest arises from classroom discussion, conversations with friends or other experiences, Brearley’s clubs and activities promote collaborative and leadership opportunities while honing a range of valuable skills. Throughout their Brearley years, students can choose to participate in a variety of both School and student-led initiatives. In Lower School, girls may participate in afterschool programs offering arts and crafts, cooking and indoor and outdoor play. Beginning in Middle School, offerings broaden to include activities sponsored by the School (such as Orchestra and Chorus, Student Government, Math Team, Carpentry, Photography and Theater) and expand further in the Upper School to include student-initiated clubs (such as the Environmental Action Committee, Classics, Creative Writing, Global Girls and Debate). Upper School students also have the opportunity to create and shape their own activities through the creation of a Common Interest Organization (“CIO”), which functions as a club “incubator.” With the help of an advisor, a student may submit a CIO proposal for approval; an approved CIO may apply for club status after two years. Clubs traditionally have two co-heads, and must meet certain reporting and other administrative requirements. Erica Dawson has selected Katherine Barrett Swett '78 as the 2019 winner of the Donald Justice Poetry Award. Her manuscript of poems, Voice Message, will be published by Autumn House Press in Winter 2020.